Often, when members of major bands take off and do their own thing, their attempt to define themselves fails miserably. Either it’s awful or it sounds exactly the same as their previous bands. But fear not my friends, Poor Moon, the latest project from Christian Wargo and Casey Wescott of Fleet Foxes and Crystal Skulls, is neither of these things. 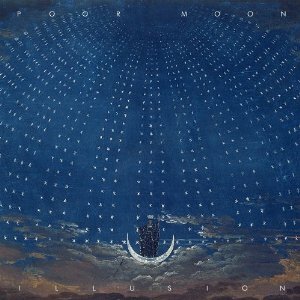 The debut album, Illusion from this new Seattle band offers a smooth sound that is simultaneously modern and nostalgic. Poor Moon may just be the new Simon and Garfunkel. Their songs are simple and melodic with the consistency of a guitar in the background. Lead singer Wargo has an echoing quality to it; instrumentation is simple and repetitive. The synth in the background of “Anyplace” rises and falls like a wave. The first single to be released, “People In Her Mind” sounds like something that would be played on a jukebox in the sixties. Illusion is smoky, soulful, and refreshing. Poor Moon finds a balance between past and present, creating a sound that you won’t want to miss.